Trees lay on the top of a home after hurricane Michael passed through the area on October 10, 2018 in Panama City, Florida. The hurricane hit the Florida Panhandle as a category 4 storm. A Sheriff's official confirms one Florida Panhandle man was killed at home by a falling tree during Hurricane Michael's passage. Authorities say a Florida Panhandle man was killed by a falling tree as Hurricane Michael tore through the state. 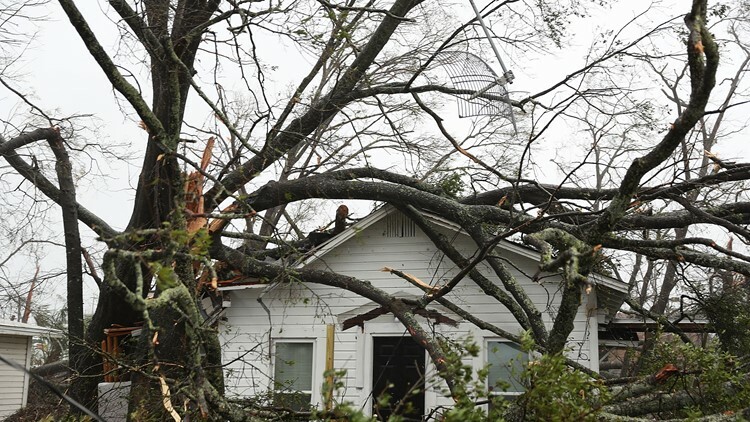 Gadsden County Sheriff's Office spokeswoman Anglie Hightower says they received a call around 6 p.m. Wednesday, saying a tree had crashed through the roof of the man's Greensboro home and trapped him. Emergency crews were heading to the home, but downed power lines and blocked roads were making the trip difficult.